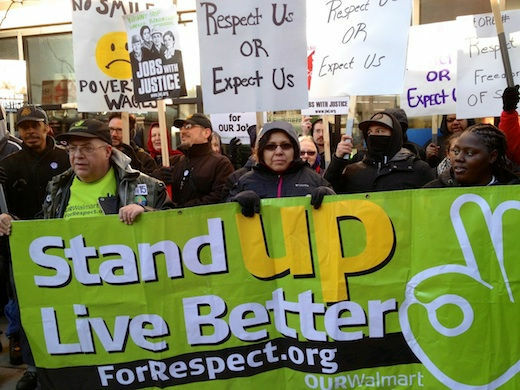 CHICAGO – Walmart workers and their supporters confronted Walmart throughout the city here Nov. 29 during nationwide Black Friday protests for higher wages and against the retail giant’s retaliation of workers who exercise their right to organize. 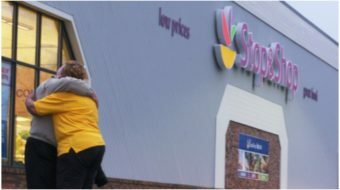 At a “mini” Walmart on the northside, two store employees joined the protests and were arrested, along with 10 others, as they did civil disobedience. Hundreds of supporters converged on the Lakeview store to show their support. Called Black Friday because it marks the Friday after Thanksgiving – the “traditional” day when retail stores say they start making a profit for the year – going from red ink to black ink. However, adding to the protest this year was the decision by many retailers to stay open throughout Thanksgiving. Walmart Black Friday 2013 4 from Scott Marshall on Vimeo.